Q: What is port number? Q: How can I find out IP address and port number? Q: What does "Address family not supported by protocol family" mean? Q: What does "Operation timed out" mean? Q: What does "No route to host" mean? Q: Why mouse cursor doesn't move when I move iPhone with enabling 'Mouse moving by Accelerometer' feature? Q: What does "Peer Disconnected" mean? In a word, please use 5583. Network applications need a port number to connect with others. Most applications have well known numbers, but RemotePad does not. So please enter '5583' for a port number. If you use a Windows, please enter the IP address and the port number that RemotePad Server displays. If you use a Mac, you don't have to enter the IP address and a port number for your Mac, you could select the name of your Mac in a list. This image shows a list of names which you can select. (Only one Mac named 'shloeder' is found in a list of this image.) In technically, iPhone/iPod touch serarches your Mac with Bonjour technology, so we don't have to and could not know the IP and port of Macs. If you cannot show your Mac in this list, please check the WiFi connection of an iPhone/iPod touch is fine, and an iPhone/iPod touch and your Mac are in the same network. If you use an UNIX like Linux, please check your network configuration and find the IP address that you use. The port number is 5583. If you use a server for Mac OS X version, please check the "Firewall" tab settings in the "Security" part of the "System Preferences". The Firewall tab shows allowing or denying connections of your Mac. 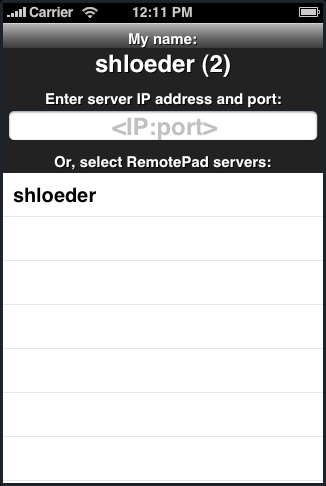 RemotePad Server needs one of following settings to use. Check a "Set access for specific services and applications" option and click an "Allow" button in the popup dialog window which appears when you start the Server. Check an "Allow all incoming connections" option. NOTE: This changes the network security behavior of your Mac. There are many reasons to display "Operation timed out" error. One reason is the Windows Firewall. If you enable an option "Don't allow exceptions" on a General tab of the Windows Firewall, or if you disable an option "Display a notification when Windows Firewall blocks a program" on a Exceptions tab of the Windows Firewall, please disable a option "Don't allow exceptions", and enable a option "Display a notification when Windows Firewall blocks a program". NOTE: This changes a your PC's behavior of network security. Another reason is typing an incorrect IP address and a port number. IP addresses and port numbers are not familiar things for everyone, please enter carefully. The error message "No route to host" means that your iPhone / iPod touch does not have a network connection or route to a RemotePad Server. I guess two reasons for this error. Your iPhone / iPod touch and your PC are not in a same network, and your home router or your home wireless access point does not allow communications between your iPhone / iPod and your PC. To solve the problem, you have to change the setting of your home router or your home wireless access point. Your iPhone / iPod touch does not connect to your network. Please be sure that your iPhone / iPod touch join the correct WiFi network. Keep tapping a touch pad area for mouse moving by Accelerometer. rarely, iPhone OS network is unstable.